Justice for women is essential to fulfilling a key aspiration of the 2030 Agenda for Sustainable Development: ensuring no one is left behind. Without equal and effective justice for women and girls – more than 50 per cent of the world’s population – sustainable and inclusive development will remain elusive. Many of the Sustainable Development Goals (SDGs), including those related to education, health and decent work, cannot be achieved without justice for women. The 2030 Agenda has rallied unprecedented political commitment, serving as an opportunity to enhance justice for women and girls. In May 2018, a High-level Group was convened by IDLO, UN Women and the Pathfinders for Peaceful, Just and Inclusive Societies to advocate for the centrality of women’s justice needs in the implementation, monitoring and reporting of SDG 16. The High-level Group on Justice for Women constitutes a critical channel to inform and enrich the global Task Force on Justice, a Pathfinders initiative established to accelerate progress on the 2030 Agenda’s target 16.3 on access to justice. Tasked with developing concrete recommendations on access to justice for women and girls, the High-level Group acts as a gender-responsive contribution to the work of the Task Force. The meeting was opened by Sigrid Kaag, Minister for Foreign Trade and Development Cooperation of the Netherlands and Co-Chair of the Task Force on Justice, and IDLO Director-General Irene Khan. During the meeting, members of the High-level Group – top government officials, academics, civil society actors, and international organization leaders – stressed the Group’s role in generating action and political commitment by expanding partnerships with regional networks, associations and donor organizations. 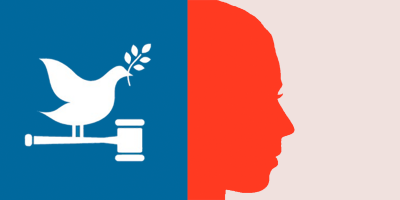 The Group will now develop a report providing recommendations for action and investment to enhance justice for women, which will be launched during the 63rd session of the Commission on the Status of Women and will contribute to the launch of the report of the Task Force on Justice during the High-level Political Forum in July 2019, as well as the 2019 UN General Assembly. A Background Paper was circulated during the inaugural meeting to provide a starting point for the discussion of the Group and to support the drafting of its report. There is a clear link between gender and justice; between SDG 5 on gender equality and SDG 16 on peace, justice and strong institutions. While gender equality is indispensable for peaceful, just and inclusive societies based on the rule of law, women and girls play a critical role in the emergence of equitable and inclusive institutions. At the same time, effective justice systems are central to enabling women to become equal partners in decision-making and development. The ability to access justice is an essential means to claiming and realizing women’s rights. Yet there is a huge disparity between the promise of justice under SDG 16 and the lived realities of women and girls; between what women and girls need and want when they seek justice, and the justice they receive. Worldwide, 104 economies still have laws preventing women from working in specific jobs – such as mining, manufacturing and construction. Only 40 per cent of economies mandate equal remuneration for work of equal value. 45 economies do not have specific laws on domestic violence, and 59 economies have no laws on sexual harassment in the workplace. Male dominance in family relations is also evident in data showing that in many economies, a woman cannot apply for a passport, be head of household or travel outside her home in the same way as a man. A growing body of evidence points to serious gaps in ensuring equal legal protections for women and girls, especially those affected by conflict or humanitarian crises. Gender discriminatory legal frameworks and social norms can constitute serious hurdles to the delivery of justice for women. Even in the presence of gender-responsive laws, implementation is often poor due to a variety of technical, financial and political factors. Challenges result from failure to consider the interaction among laws, regulations and implementing institutions, and their collective impact on women’s rights. For example, regulations often require that a national identity card, birth certificate or deeds from a land registry office be provided to obtain land rights, titling and registration. These certificates and deeds are often inaccessible to rural or poor women who have limited time, money, access to facilities and networks. Ineffective and unresponsive judicial systems, compounded by gender bias, socio-economic barriers and limited access to information and support, can further result in women being prevented from claiming their rights and accessing redress. Furthermore, a large proportion of women worldwide access justice through customary or informal justice mechanisms that are frequently biased against them yet adjudicate matters that impact women more than men, such as inheritance, property or domestic violence.